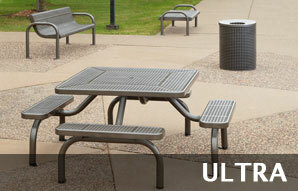 The Ultra Collection by Anova is the ultimate in high performance outdoor furnishings. This awesome collection of Steel Pinic Tables, Trash Receptacles, and Park Benches allows you to create a complete, coordinated site furnishing. 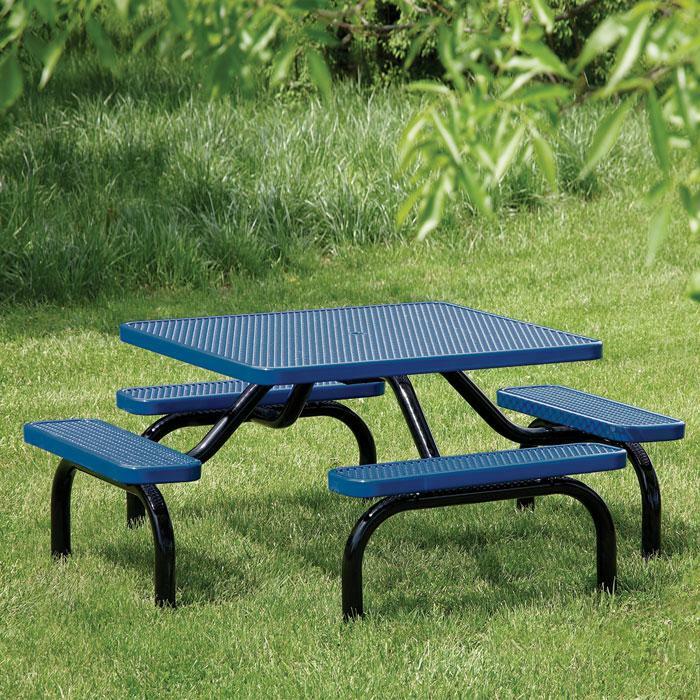 This collection has the widest available options in beautifully crafted steel picnic tables. Choose from three distictive steel patterns - perforated steel, expanded steel and slotted steel. Heavy-duty frames are constructed from 2-3/8" OD steel tubing creating a solid table. All components are powder coated with a high-gloss finish that is protected by FusionGuard for extreme rust resistance. Table tops and seats are further protected by a thick plasticol coating that creates a comfortable seating surface that remains cool in the summer and warm in the winter. Choose from a wide variety of configurations and shapes. Click on the images below to see all of the available options offered in the Ultra Collection by Anova.